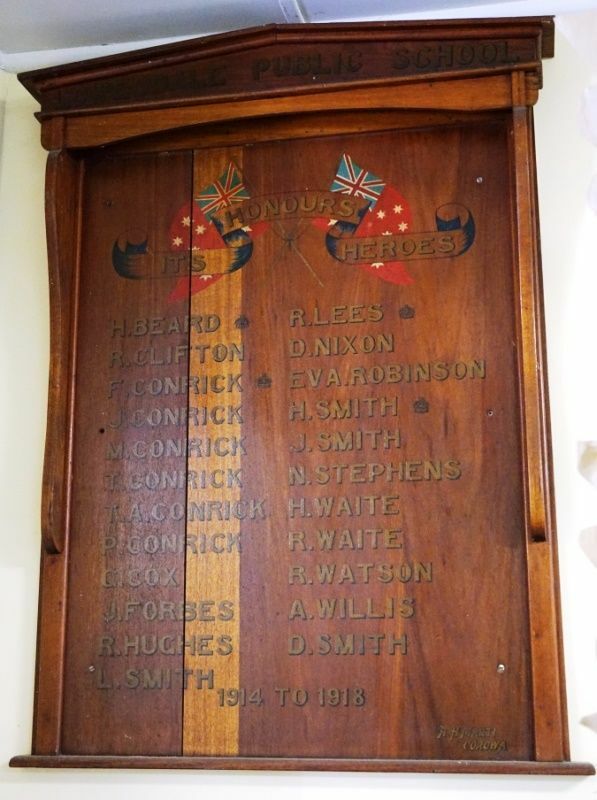 A wooden honour roll commemorates former students of the Loewsdale Public School who served in World War One. The ceremony of unveiling an honor board at the Lowesdale Public School was performed by Mr. J. H. Izon, of Burryjaa Estate on Wednesday afternoon last in the presence of a moderate gathering of district residents. The extremely hot day doubtless prevented many people from attending. The president of the shire (Cr. F. W. Knight) presided, and in his introductory remarks he referred to the splendid record put up by the Lowesdale district in the number of men it had sent to the war. He said that he did not know of another district of similar size which had contributed so many. Prior to the unveiling of the roll of honor Mr. lzon made a most appropriate address. As he drew aside the flag which covered the board the entire company stood in silence for some minutes. Albury Banner and Wodonga Express (NSW), 13 February 1920.